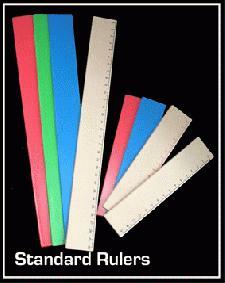 Time to draw a line under your company name with a bold promotional statement - with a ruler with logo. Available in various colours and sizes - these printable - customised rulers are absolutely essential to gain the retention of your corporate customers and clients. These rulers are most effective to strengthen the brand awareness at mind - and with its practical use - can act as a professional freebie or giveaway. Just choose which of our Rulers with logo you prefer and we'll see that it gets printed up with your business details and company logo so when you give them away to your staff and customers as a promotional gift, your advert will keep you more than 12 inches ahead of your competitors in the advertising game. To find out more about our Rulers with logo click here and fill in the contact form and we'll get straight back to you. To view our entire range of promotional advertising gifts besides our Rulers with logo please click here.